» Upon "startx" command, console freezes at "Loading extension GLX"
Upon "startx" command, console freezes at "Loading extension GLX"
I have no idea what to do. Would anyone mind lending me a helping hand? Please tell me if I'm not posting enough debug info. Re: Upon "startx" command, console freezes at "Loading extension GLX"
Ugh, this is so frustrating. 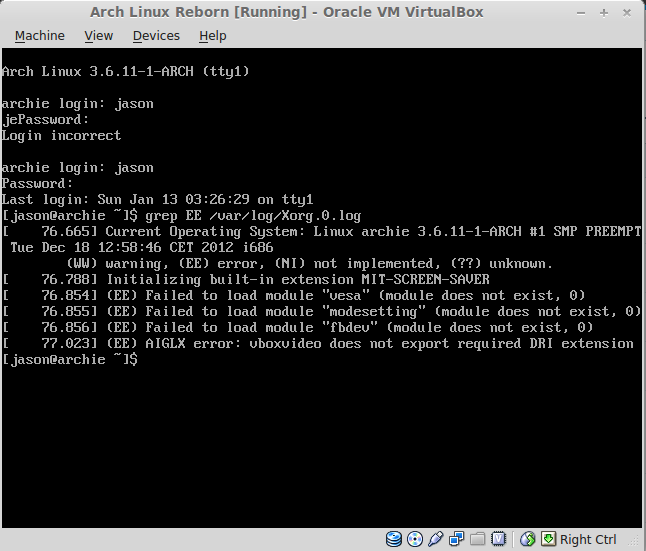 I've tried installing Arch like 3 times now, and every time I end up with a problem that I don't know how to debug. Shiiiiiiit...I'm gonna set up a third partition for Arch and see if I don't run into this problem on a native install. Basically there is a problem with vboxvideo, some issue with the latest glibc. Check out this post (https://bbs.archlinux.org/viewtopic.php?id=155450) and the bug report linked there. You can resolve by not loading vboxvideo which will lose you 3D acceleration but X will run. "That doesn't work" is not a productive progress report. It certainly wouldn't give the same errors. If it's frustrating for you, imagine how it feels for someone who tried to offer a suggestion and got back only "Meh, it doesn't work." Perhaps instead of trying the same thing three times in a row, you'd actually start troubleshooting. Thanks for the help guys! 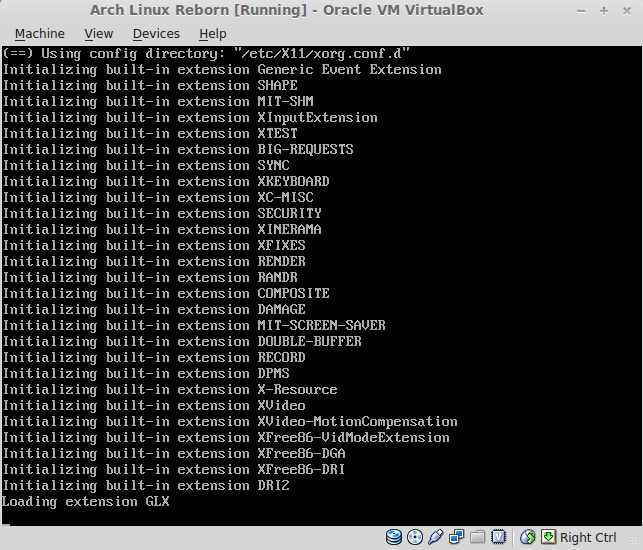 I got a native Arch install to work. Sorry if I pissed you off Trilby. At the very least, people with the same problem can now find this topic on the forums. Well, you better not piss him further. Edit your first post and add "[solved]" to your thread title.